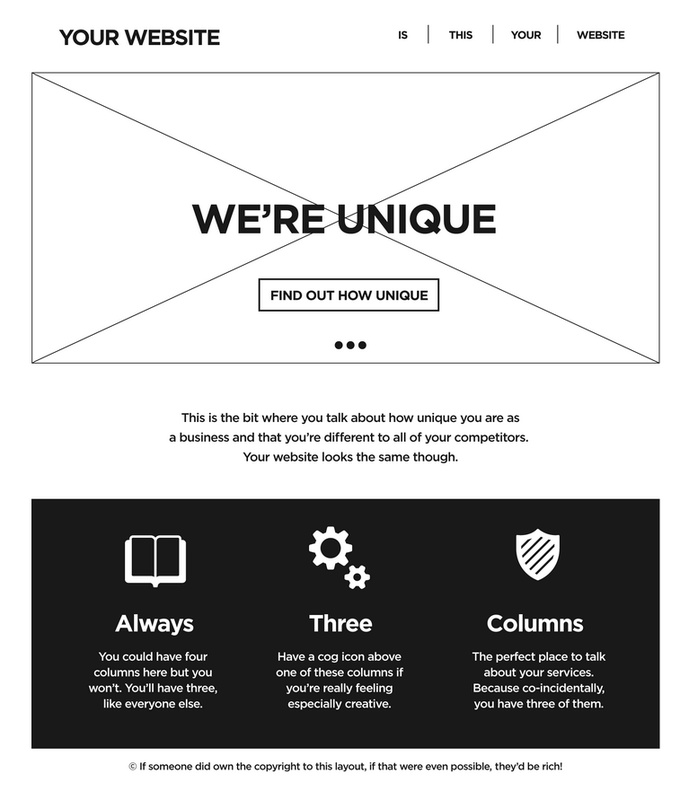 Dave Ellis points out the weird sameness striking corporate sites all across the land. There really is a horrible repetitiveness to it. Some of it comes from some de-facto standardization on boostrap - or at least some libraries that look an awful lot like it. 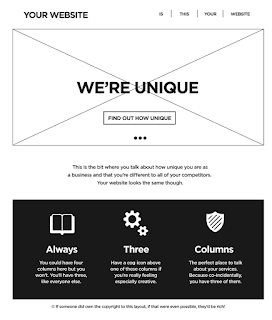 It goes hand-in-hand with the need for responsive design: the header, splash image, and columns can collapse into a single, thinner column readily, so little thought has to be put into it. Plus ça change, plus c'est la même chose. Except it doesn't take that much skill to pull off now. If you're a fretting procrastinator - someone who puts off doing things because they're anxious about success with the next bit of whatever they should be working on - one useful skill to develop is re-channeling the energy pushing you away from one task into forward momentum on another. I call this "procrastination jujitsu". This weekend I was kind of feeling angst-y about choosing a box2d js wrapper and learning it well enough to recreate some games I developed using a simpler physics system. I took that fret-energy and started a project I'd been meaning to get to for a long time: Gazette Galore, mini reviews of every game published on disk by COMPUTE! 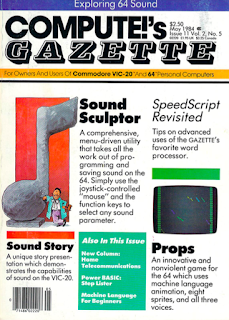 's Gazette, a Commodore-home computer magazine that ran from the mid-80s to the mid-90s. The blog came together pretty well. I've gotten over my "Not Invented Here" syndrome and have been happy enough using blogspot for this blog that it made sense to apply it for this. A nice feature too, is: my Gazette Blog has an ending, unlike this devblog that might just go on and on and on and on. Anyway, this particular magazine was important to my young geek self. I was lucky enough to get a pile of magazines and accompanying disks when I inherited my Uncle Bill's C=64. As I read through the old magazines I'm surprised at how some of the game articles don't just describe how to play the game, they get into how it was made, and some of the programming Tips and Tricks takeaways. 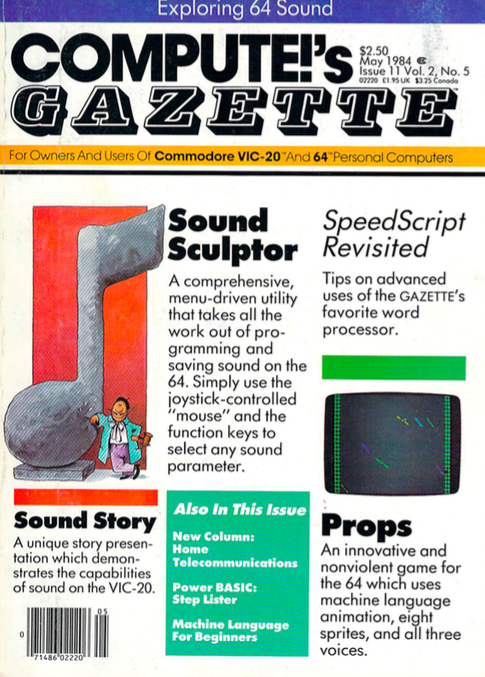 The whole magazine is much more programmer-centric than I remembered - computers of this era really encouraged the hobbyists to get in there and make something. At work we use Robot and Selenium to do automated testing. Most of the page selectors use xpath; at first I didn't like that (vs using css selectors), because it seemed like another thing to learn without adding value (I mean most of us know CSS already but this is the only place we were using xpath) but the fact that xpath can do a contains(text(),'Some Text') makes it worth its conceptual weight vs CSS. was failing because the matching item wasn't visible, even though to the casual observer it certainly seemed visible, with the parent menu open on the page. The previous solution was to have the robot test close the browser and re-navigate to the page... obviously overkill, and it worked, but we weren't sure why. finds the last and relevant instance to click on. Although this last() required some extra parens (to make sure we were finding the last of the matching set, and not indicating we wanted the something that was the last among its siblings in the DOM) it seems easier than rigging up an xpath to indicate "the visible one" - that gets complicated. in the console returned 1 instead of 2 or 0, we knew we had finally constructed the xpath properly, and we were able to iterate on variants of the syntax much more quickly than if we were waiting for robot to churn through the test. Of course, one additional takeaway (especially relevant for the unwary UI developer turned QA engineer) is the empirical observation that Robot's use of xpath selectors is very different from jQuery's use of CSS selectors when multiple items are hit; much of jQuery's power is effortlessly applying operations to all matching nodes, while evidently Robot will just take the first match in the set. A test was failing because the order of the classes applied to the element had changed. sound effects in processing to processing.js conversions. Over the past decade I wrote a lot of games and toys in Processing. When I ran into the original IDE/Applet generating kit in 2004, it was empowering. Visual Basic is the only other language that comes to mind in my developer history as a powerful, flexible, easy-to-learn toolkit for making fun interactive things that I could share with others. From that forum, I also learned that it transpiled Processing is being deprecated in favor of p5, which provides the classic Processing API in code to be called natively by your js. Transpiling was always such an odd beast that I don't really mind moving on... and I guess I shouldn't feel to bad about the hacks I do to support my legacy Java/JS cross-compiling modes. Next step: finding a good 2D Physics solution. I had done some cool things Jean Maxime Coulliard's PPhys2D, now defunct- but it had an awesome learning section. I need to find a good wrapper for Box2D, and may end up porting those things to P5. I've finally turned my attention back to my lowLag low latency HTML5 audio project... I've been neglecting it for far too long, especially considering it's the strongest example of a successful opensource project in my portfolio. safelyRemoveElement points out how jQuery's $("some selector").remove(); covers up how you really are modifying the parent of an element when deleting the child. It's clunky but not terrible. It's designed for generic hardware with a phone-like numberpad and an arrowkeys crosspad but no alphanumeric keyboard, so you press a button, and then a vaguely T-9 like menu pops up, and you press the direction you meant. But you know, not bad use for limited hardware input. But now in the other room there are nice little desktop unit with touch screens! We can put this awkward and clunky UI stuff away and just type, right? Nope! They use their lovely touch screen as a number pad, and a crosspad of directional buttons. Making things even weirder is how the "OK" button is actually in the middle of the virtual crosspad, took me a minute to figure that out. So you can see there's a virtual onscreen keyboard... being operated by the remote's arrow keys.